Vic Stone, son of scientist Silas Stone, was outfitted by his father with experimental robotic prosthetics after a freak lab accident that killed his mother and left him devastatingly injured. Struggling to come to terms with his now half-robot form, he joined the Teen Titans, became a hero, and learned to cope with his new body. After the New 52 2011 DC reboot, Cyborg became a founding member of the Justice League, cinematically hinted at in his brief appearance in 2016 film Batman v Superman Dawn of Justice. At Superheroes Direct, we bring you Cyborg collectibles and apparel featuring this half-human, half-robot superhero, including shirts that depict Cyborg standing among his fellow Justice League heroes. Keep checking back here at Superheroes Direct for more additions to our collection of Cyborg merchandise. Blasting through a boom tube the New 52 Justice League travels the galaxy in to bring order and peace. 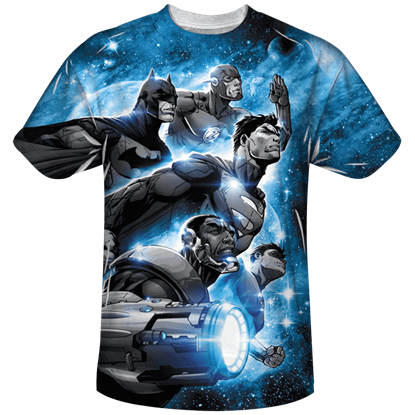 Featuring Batman, Superman, Green Lantern, Cyborg, and The Flash, the Atmospheric T-Shirt is great for any fan of the New 52. When the Justice League of America arrives, you know that you are safe from the powers of evil! 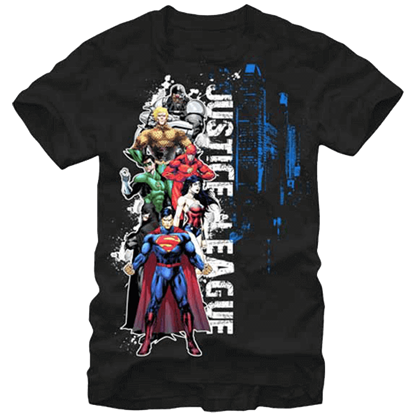 Seven Leaguers come together on this Justice League Assembled T-Shirt, displaying one of the greatest superhero groups of all time. Fans who can hardly wait to see Victor Stone in action on the big screen can tide themselves over with this adorable collectible from Funko. 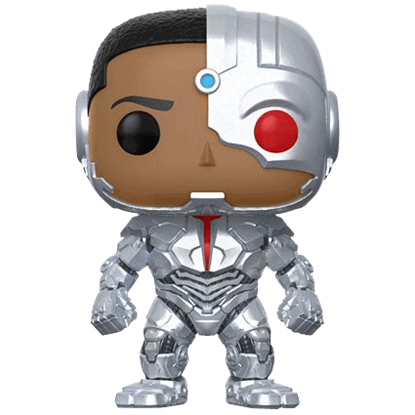 The Justice League Cyborg POP Figure is an exciting new addition to the POP heroes line. As a result of a lab experiment gone wrong, Dr. Silas Stone was forced to fit his son with robotic prosthetics, turning him into Cyborg. 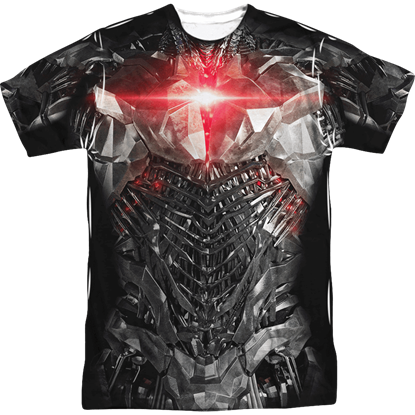 The Justice League Cyborg Uniform T-Shirt is based on visuals from the Justice League movie. In an attempt to keep their franchises as fresh and exciting as the day that they originated, DC Comics revamped their universe with the New 52. 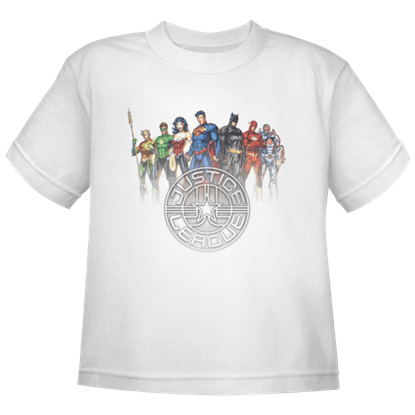 The Kids New 52 Justice League Crest T-Shirt displays the new faces of the Justice League. 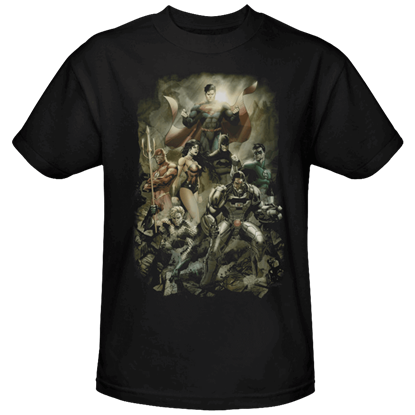 Depicting the new rendition of the Justice League founders, the New 52 Aftermath T-Shirt displays a scene of utter destruction. In this graphic the dust is shown settling after what appears to have been a battle of heroic magnitude. 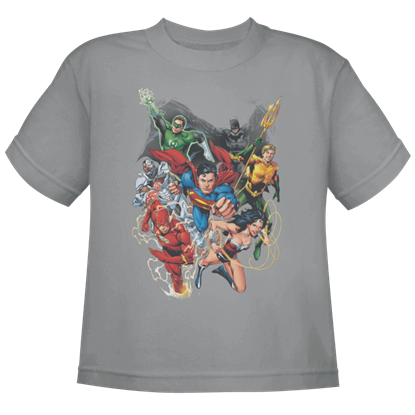 Featuring a delightful design of the relaunched Justice League squad, the New 52 Justice League 1 Kids T-Shirt is a superb shirt for any young fan of DC Comics and their 2011 universe reboot in which all characters began anew.